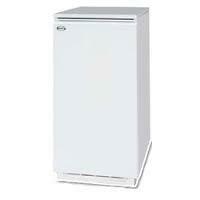 The Envirolite Utility internal regular oil is a condensing floor standing boiler. This boiler is designed to be placed in a kitchen, with it being a compact product that is able to fit under a standard kitchen worktop. With this design having a white casing finish, it has been manufactured by Firebird. With this range comes a variety of features and benefits, all allowing for a highly efficient unit, with this being shown through its A rating, as well as high efficiency rating of 92%. This boiler comes with an output rating of 35kW making it perfect for the larger properties with multiple bathrooms, and a higher demand for heating and hot water, with this model being available in a variety of other outputs this boiler is able to suit anyone's home. This boiler comes with features that include a patented heat exchanger design, multiple tapping points for ease of installation, helping to save you the time and money on installation, it has a front service access, it is fully insulated and acoustically designed for ultra quiet operation, has multi directional flue options, and high performance riello RDB burner complete with a fully diagnostic control box, and a optional condensate pump. All of these features allow for a unit that you can be sure is not going to let you down. With this boiler being a regular unit it incorporates a hot water cylinder which is often fed by a cold water storage cistern located in the loft and a feed and expansion cistern which is also located in the loft. This boiler features a two year warranty so you can be sure you're getting a boiler that is reliable and not going to let you down.